For the chocaholics who can't get enough of our Blissful Brown Rice and Raw Cacao. Now you can get even more organic yumminess AND save money. Grow and repair lean muscle. Give you great skin, hair and nails. 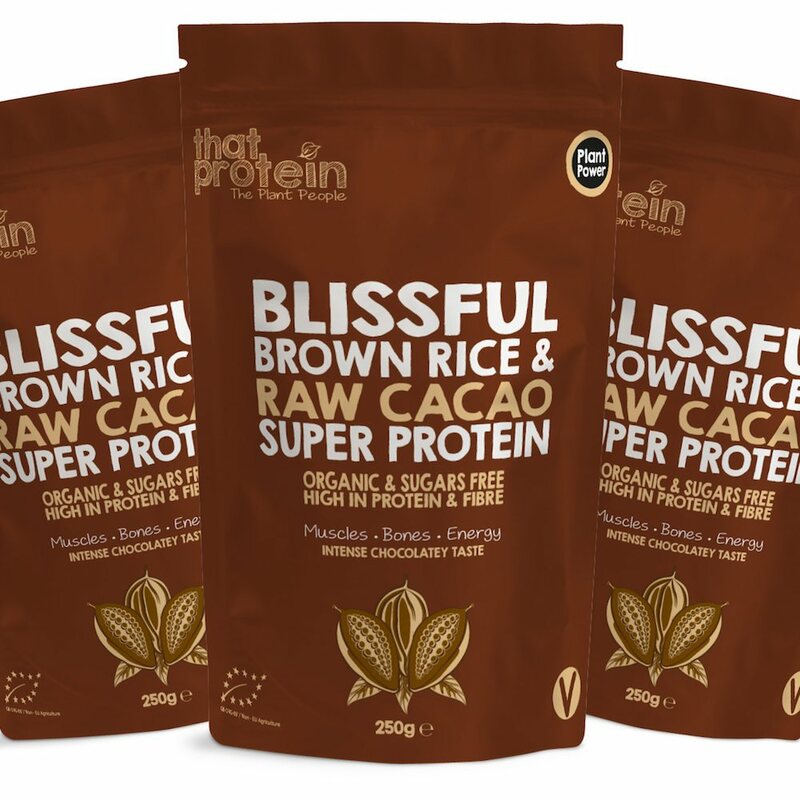 Blissful Brown Rice and Raw Cacao Super Protein is different from other protein powders as it contains delicious organic cacao for a healthy immune system and an antioxidant boost. that protein plant protein, vegan, vegetarian nutrition mixes are the perfect addition to any nutrition plan. Brown Rice Protein uses non-GMO whole grain brown rice and it is hypo-allergenic and completely dairy and lactose free. Brown rice protein is a complete plant protein that helps support healthy muscles, skin, hair and nails. It has a 98% correlation to mother's milk and a 97% correlation with whey protein. Cacao is a top source of antioxidants and it contains an abundance of magnesium and iron. It is widely recognised for the naturally occurring chemicals it contains which stimulate the happy centres in our brain. No other food in the world is known to contain as many mood-improving substances as cacao. BROWN RICE PROTEIN Rice protein with raw cacao is an excellent alternative to dairy protein. Our rice protein powder starts with organically certified, non-GM rice. Our brown rice is whole grain brown rice and it is hypo-allergenic and completely dairy and lactose free. RAW CACAO Our raw cacao comes from the cacao tree, native to the fertile forests of South America. It is famous not only for its unique taste, but also for its therapeutic and nutritional properties. The generic name – Theobroma – literally translates to ‘food of the gods’. Cacao was first cultivated by the Olmecs in Mexico as early as 1000 BC and was used to make fortifying beverages. Over time the Mayans and Aztecs adopted cacao into their own cultures, incorporating the drink into ceremonial rituals and even using cocoa beans as currency. It wasn’t until the Spanish arrived in the 1500's that cacao was introduced to Europe. Here, the cacao drink was sweetened by adding sugar, cinnamon then heated to improve its texture. Cacao also came to play a medicinal role, used to treat a range of afflictions, from smallpox and yellow fever to cholera and snakebites. that protein plant protein, vegan, vegetarian nutrition mixes are the perfect addition to any nutrition plan. Organic brown rice protein powder (52%). This protein powder is rich and creamy but not too sweet or bitter taste...it really is a lovely flavour. So far I have used it in overnight oats, smoothies and hot chocolate as it is yummy. I find using protein powder keeps you full especially when you need to maintain weight and well worth subscribing for this price. I am glad this was recommended to me as it is my favourite and love it! My first ever protein powder and I love it! My first ever protein powder and I love it! The taste is not strong at all, no chunk or anything, honestly it's perfect! Organic, dairy-free, plant protein super food blends with no sugar, stabilisers or preservatives, the first of its kind.